Can you find me? I’m the leaf set that looks like a tomato. Confession time: I am the worst potato harvester around. Granted, when I harvested these beds last fall, I did have some help. Distracting help as it happens, too, as the child was doing her best to help too. But honestly. 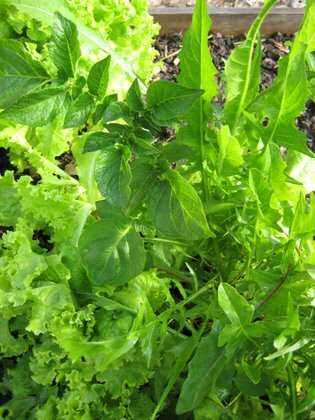 These are clean beds, easily worked: unlike the outside gardens, the soil in the greenhouse is light and fluffy. There should be no difficulty at all in finding absolutely every recalcitrant spud in the ground. Yet, about two months ago, I found a sprout. Then another. And then another. It got quite ridiculous when a sprout showed up a the path between the beds. The path! Like one’s kitchen counters, or desk, both the paths and the beds in the greenhouse are entirely familiar to me. How in the world could I have missed a potato in the path? But I did. So, sap that I am, I will allow them to continue to grow. I’ll have a harvest around my birthday in early July. Ha! I’ve got the same thing going on. There are about a half dozen potato volunteers in the plot I planted them in last year, so the new stuff just has to go around them. Which is cool, it’s mostly herbs in that plot this year, so there shouldn’t be any problem with them sharing the space. HAHA…the same exact thing happened to me, except it was because i threw compost that wasn’t quite ready under my new garden and now i have a mystery potato plant growing among my cucmbers! I always find some but this year I found some about…..20 feet from where I have ever had them. Go figure! Maybe a seed?? Or maybe I dropped a little spud somehow. Who knows. They sure are persistent little boogers though. No big deal—and almost all of mine are the blues so I am extra happy since those are one of my favorites. 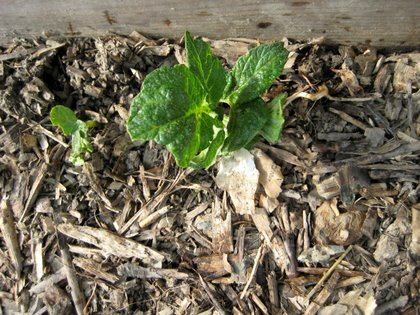 I’ve got my first-ever potato plants coming up now, and until I read this post of yours, I’d never have known when I might be able to harvest them. Rob: Yeah, it happens to me every year too but I swear I was being more careful last harvest! Really! Agh. Luckily this is so not the worst “problem” we could have, eh? Seagrass: Oh yes compost potatoes are the best. I swear that’s where my best harvest is for many things: cucumbers, squash, even tomatoes, all from things (or in the compost pile itself) that didn’t get cooked enough in the pile. Again, it’s really not a “problem,” it’s just kind of funny, right? Monica! Seeds! Do they come true? Hmm: that’s something I need to research. You know, I cheaped out and didn’t get blues this year, though I had hoped to. With our clay soil my harvest for most but the toughest is really iffy, especially in wet years (yep not for you but for me) last year. But I have heard and read that blues tend to be kind of tough and ready to rumble despite any condition. CC: I should clarify: that’s when I expect to harvest new potatoes! The general rule for harvest is when the tops yellow up and die down. That means they’ve gotten enough energy from the leaves to put into the below-ground branches (for that is what potatoes are, did you know? they’re not roots) to carry through for the long winter ahead. I figure the greenhouse gives me up to a two month advantage over the grounds outside. Normally I am grabbling spuds in mid-July outside for new ones, early harvest is early Aug. and late harvest is in Nov. Okay enough potato talk here before coffee even! I have a whole row we missed last fall that just popped up! Ooops! Hah, Stacie, now you don’t need to plant another row! Think of all the time you’ve saved!! I’m so glad you posted this. Too funny! I have them coming up outside of the perimeter of the garden. I leave them, of course, because the more food that grows the better, but we are having trouble avoiding stepping on all the ones popping up outside the garden limits. Just found your blog and having fun ready it.